The blog was really started in July 2014 as that was when we got planning permission. All entries by Kathy Smyth, one of the Co-op Directors. The Co-op has been given access by Mike and Kathy Smyth to work in their 37 acres of woodland which adjoins Springbok Estate. This hasn’t had any serious management for some decades and is overgrown and difficult to access so first of all the rides are being opened up and widened. 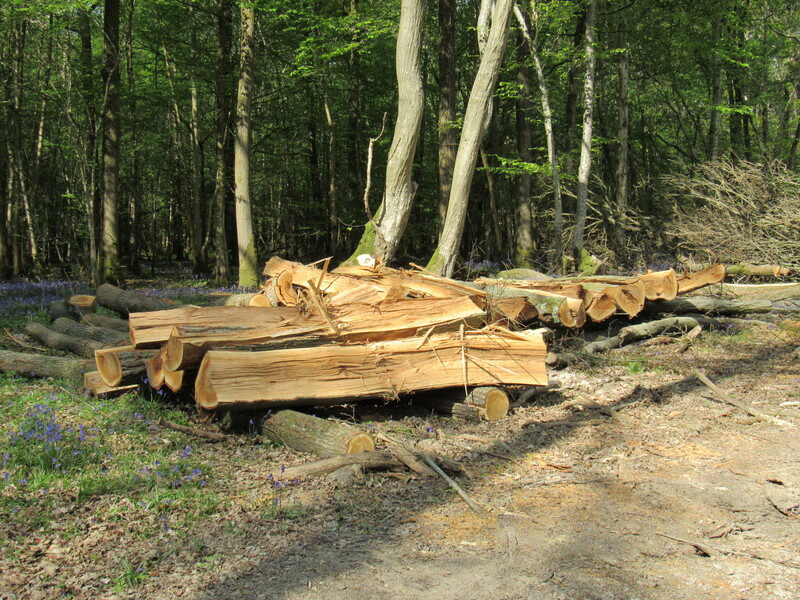 The work is being undertaken by a local forest contractor, Joe Court. Almost all the timber being felled has no market value but should have a biomass value to the Co-op because it is so close to the boiler house so transportation costs can be kept down. The work in the wood is now complete for the time being. It was taken in stages to minimise the impact on the ground. This summer we just worked on the ‘rides’ i.e. the old tracks and paths through the wood which were opened up again. As the rides hadn’t been planted for timber very few mature trees were removed, the exception being any Turkey Oak which we could access. A few words on Turkey Oak. Turkey Oaks were introduced as an ornamental tree a couple of centuries ago but they have now spread into native woodland. It is pretty difficult for the inexperienced person to tell the difference between a Turkey Oak and a native (I struggle). They are not welcome not least because they hybridise with our native oak and the resulting oak are sterile. Turkey Oak is useless as timber as it splits and warps during seasoning. It is also pretty unpopular as wood chip as it rots from the inside and seeing as they are fast growing and make thumping great trees Joe split them in situ. I’ve noticed that one of the stumps left is already rotting and even smells rotten. Over a kilometre of rides were opened up. There was also some selective thinning of a limited area of the seven acres of Scots Pine to see how it reacts. In other words, does selective thinning destabilise the remaining trees? We are waiting to find out but we have already had one fairly serious storm since this was done and we don’t think that it will. All the felled timber was then left in situ until the ground conditions improved so it could be removed without unduly churning up the ground. That has now been done and the timber moved out to two locations and stacked according to how fast Springbok Director Tom Parker and our forester Joe Court estimate it will take to dry. 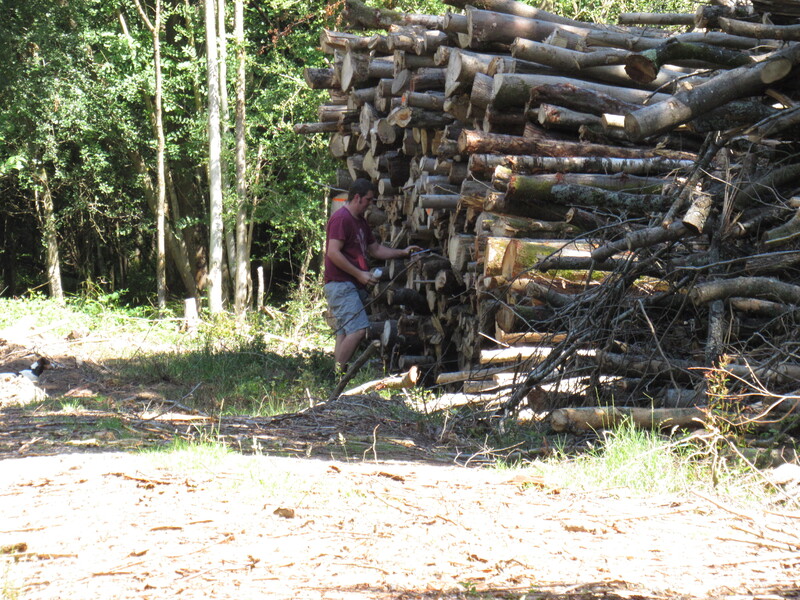 As you can see from the picture below, the result is a reasonably large amount of wood. The picture below shows the larger of the two stacking areas. 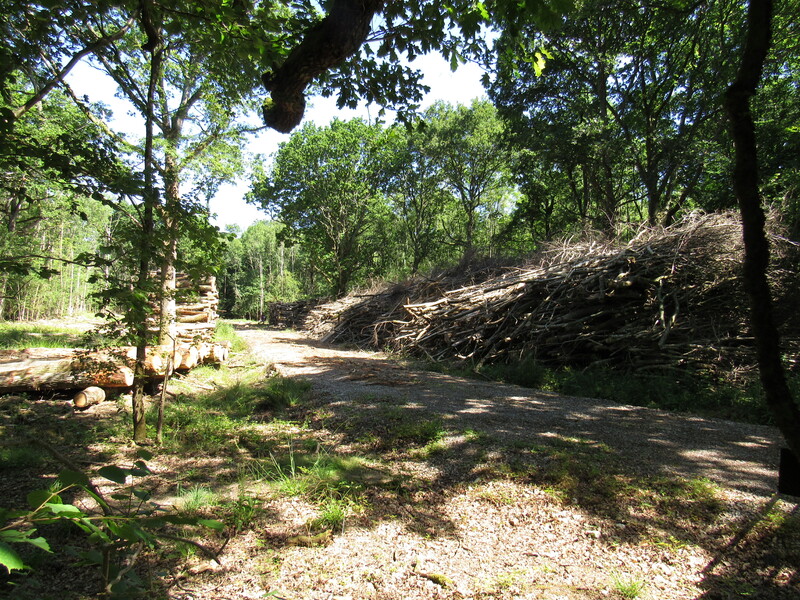 There is another smaller series of stacks at the northern end of the wood. When you are bringing unmanaged woodland back into management, the level of extraction per acre is so much higher than when you are sustainably extracting from an already well managed woodland. Basically you have decades of accumulated clearing and tidying up to do. The wood in the foreground and to the right of the track is what is called brash i.e. the tops of trees. Brash isn’t normally used for chip because it is uneconomic to move. A large pile of brash reduces to relatively little chip – a bit like spinach. As a result it seems it is often burnt in situ i.e. wasted. We think it is viable as chip because it is so close to the point of consumption. Another objection to burning brash is the amount of bark it contains. Too much bark isn’t great for boilers because bark generally contains a fair proportion of silica. However as the ground at this wood is pure sticky clay our biomass contractors Douch are more relaxed about us using the brash. Some of this brash may be ready later this year and it has been stacked next to the hard standing at the entrance to enable it to be chipped during the winter months if it is ready. Here is another close up of the small figure you can just see in the distance. This is Joe Court our forester and it should help you get a sense of the scale when I tell you that Joe is over 6 feet tall. The Springbok Sustainable Wood Heat Co-operative Limited. © 2015 The Springbok Sustainable Wood Heat Co-operative Limited. All rights reserved.